Firefox Personas is a great Firefox add-in that I only just discovered, but has been around for some time. 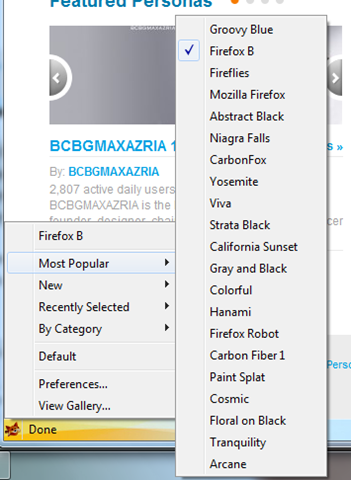 It allows you to totally customize the look and feel of the Firefox GUI and is very simple to use and configure. Personas are lightweight “skins” that change the look of your Firefox web browser. You can easily switch between Personas with just a few clicks. There are hundreds of Personas to choose from, with more added every day. You can even create your own and share it with others. As you can see, I’ve “skinned” my Firefox browser to show one of the default skins available in Firefox personas, but there are heaps to choose from as soon as you’ve installed it! My clicking the personas’ menu in the bottom left corner of the Firefox window once you’ve installed it, you gain access to the massive list of already available skins to choose from, and if you don’t like what’s on offer there, you can check out the personas gallery to see what else you might like. You can even create your own “personas” by using images you already have on your computer. The personas how to create personas page has heaps of information you’ll need to do this such as the size the images should be, and a quick 4 step guide on how its done. I did mine in about 2 minutes it was that easy. 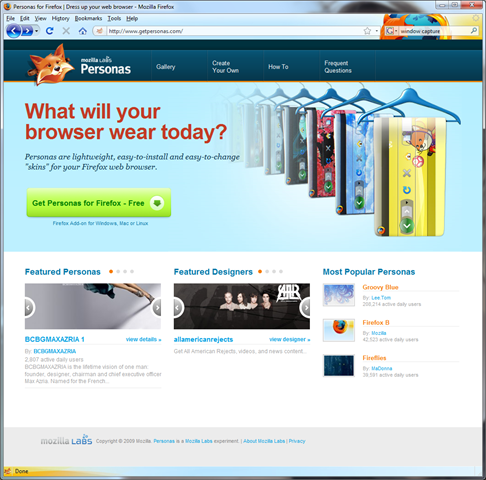 Firefox personas even work with existing Firefox themes. You really have to check out personas, its not even my software and I keep raving about it as if it was my own. I haven’t been this excited about a browser customization pack before, but this really takes the cake!